This year's Holme on Spalding Moor Summer Fayre will take place on Saturday 23 June and Sunday 24 June. Holme on Spalding Moor is gearing up for this year’s Summer Fayre which will be held on Saturday 23 June. The fayre, based at Ye Olde Red Lion, is raising funds for the Yorkshire Air Ambulance and has also teamed up with the scarecrow and open gardens event on Sunday 24 June. 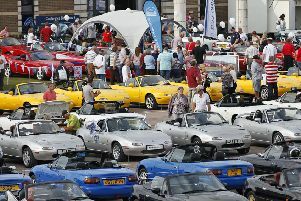 Last year’s event brought in more than £1,500 for Sue Ryder and saw around 1,000 enjoy the occasion. There’s plenty to keep residents and visitors alike happy this time around with entertainment from Harry Collins, children’s magician Ray Burrell, The Beatles Duo, the Ravens Morris Dancers, and The Gold Duo. There will be the usual BBQ, tombola and face painting, and rides alongside ice cream from Swirls in Pocklington and an outdoor gin and fruit cider bar. Chris East, organiser of the fair, said: “Last year raised over £1,500 for Sue Ryder with more than 1,000 people attending. “This year it will be bigger and better and will hopefully raise even more for the Yorkshire Air Ambulance. “We are currently collecting tombola prizes if anyone would like to donate to the worthy cause. “This time we have teamed up with the Village Scarecrow and Open Gardens event. “The fayre activities will all be at Ye Olde Red Lion on the Sunday, making it a great event for Holme On Spalding Moor that lasts the full weekend. For more details about the event call 01430 860220.